Ok. 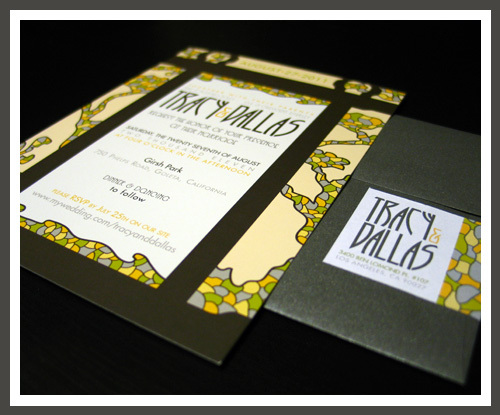 Finally, the so anticipated and much teased about Arts & Crafts Wedding Invitation is here. I just wanted to make sure the now Mr. & Mrs.' guests had a chance to view them before I shared them with you. Since the big day was this past Saturday I think we're safe in doing so. If you missed it the first time around, I shared the warm visual + sparkle with you here and the inspiration for the Wedding Invitation Suite is found here so you can see the gorgeousness of the Gamble House. 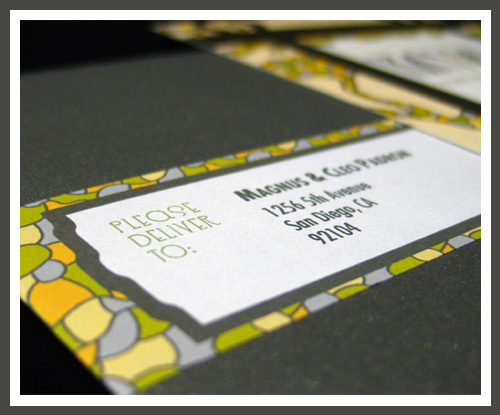 It was so exciting to work with such a great couple, and to create the custom illustrations and patterns for the overall Wedding Suite all inspired by intricate details of the so famous Gamble House 'door' was surely a high. The typeface for their names and for the custom logo, which included the wedding date, was chosen for it's call-back to the era. The rest of the information was kept in a sans-serif typeface in various colors from the chosen color palette so it accentuated the former font. 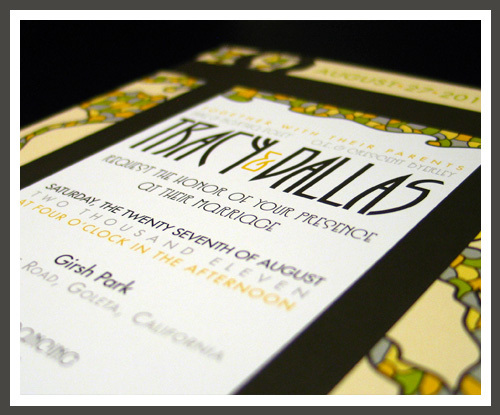 The information in the front of this Arts & Craft Wedding Invitation Suite was framed by the decorative motifs inspired by The Gamble House Door. 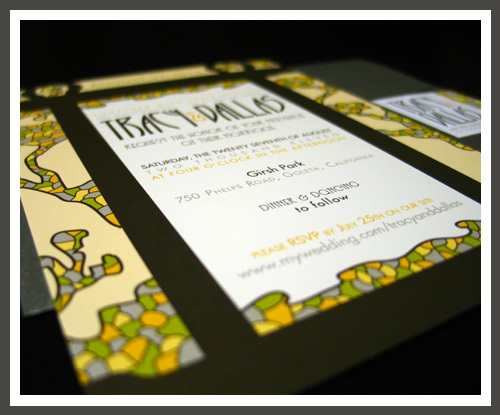 A custom stained-glass-esque pattern was inspired by the windows themselves as well, and was used throughout the Wedding Suite, included the table numbers, place cards, and thank you cards which I'll share with you later in the week. I hope you enjoyed this new addition to the LizzyB Loves Wedding Invitation catalog. If you did and would like to make it your own send me an email. I stumbled upon this while trying to come up with a design for my housewarming invitation (it's a bungalow) and I find your work stunning. It's so well executed! 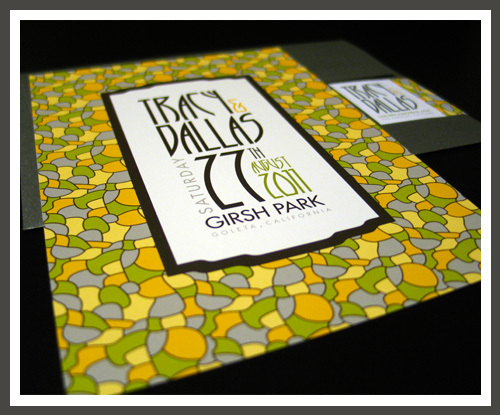 As a plus, I went to UCSB so I'm familiar with Girsh Park (aka Costco Park). 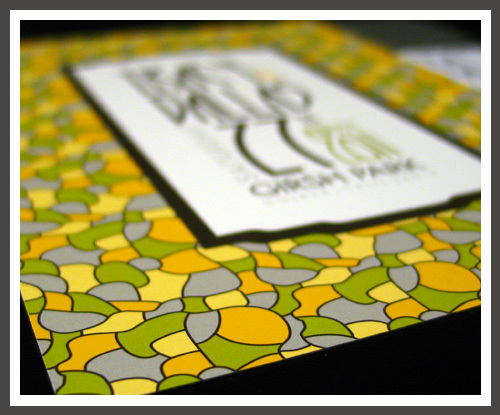 I love the fonts that you used for this invitation! in particular "Request the honor of your presence" May I ask what that font is? Thank you! Hi Josh. Thanks for the nice comment. The typeface used is SpeedballNo3 Regular. The amazing developmental benefits that children can obtain through creative craft ideas make childrens crafts such a crucial part of a child's healthy development.